There may be better cures for jetlag…then again, maybe not. 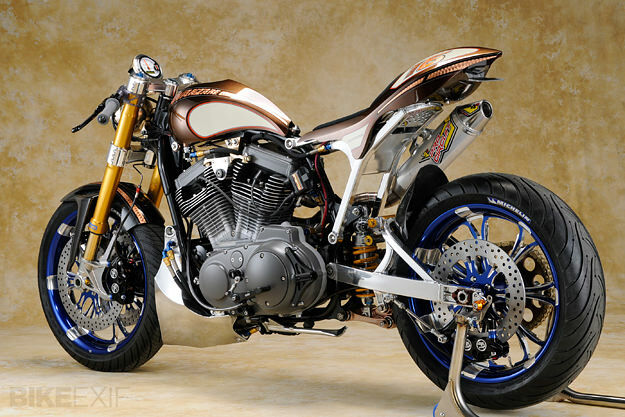 Hideki Hoshikawa had flown over from Japan with his latest build in the airplane’s cargo bay, clearing customs in Los Angeles just in time for the big L.A. Calendar Bike Show, where the Sportster-based “Avanzare” nabbed Best of Show honors and the AFT Visionary award. Next day, the bike was in the photo studio for a calendar shoot, with two leggy bikini models draped all over it. Hoshikawa was tired but hardly complaining. Mission more than accomplished—in fact, I’d rank Avanzare (Italian for “progress”) as easily the most impressive custom I’ve seen in the past year. First order of business was to bring frame geometry and suspension up to current standards. Off came the steel twin-shock swingarm, replaced with a braced aluminum monoshock job inspired by Honda’s NSR500 Grand Prix racer. 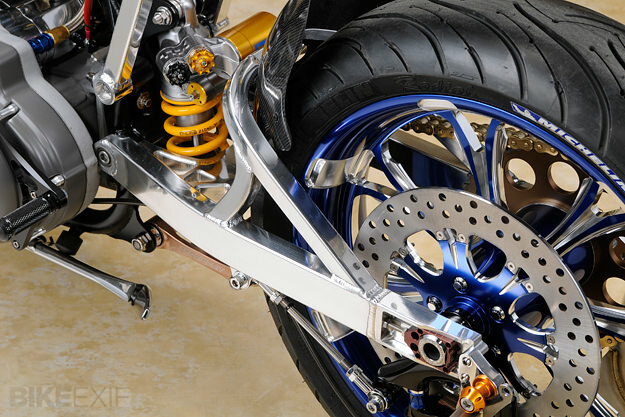 Öhlins supplied the damper and the inverted fork, the latter grasped by a custom billet triple-clamp, one of the project’s few parts not crafted in-house. All done, rake was tightened up from the stocker’s lazy 29 degrees to a much more sporting 24. 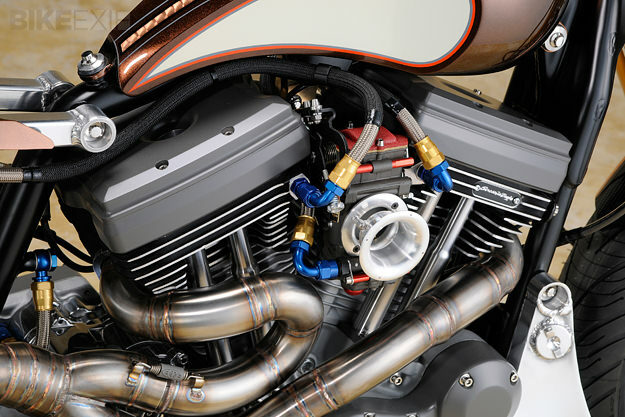 Hoshikawa broke out the aluminum tubing and fired up his welder again to create the rear subframe, which serves as a mounting point for the alloy tailsection, the dirtbike-style Pro Circuit muffler and a small catch tank for the top-end oil breathers. The main oil supply is housed in an Asterisk-built aluminum chin spoiler, its down-low location freeing up space amidships which allowed the wasp-waisted look Hoshikawa was after. The artfully arching fuel tank is steel, so severely pinched at the rear that it is barely wider than the frame’s backbone. About 100 horses make their way through Hoshikawa’s snaky 2-into-1 stainless-steel exhaust system, a masterwork of bends and welds. 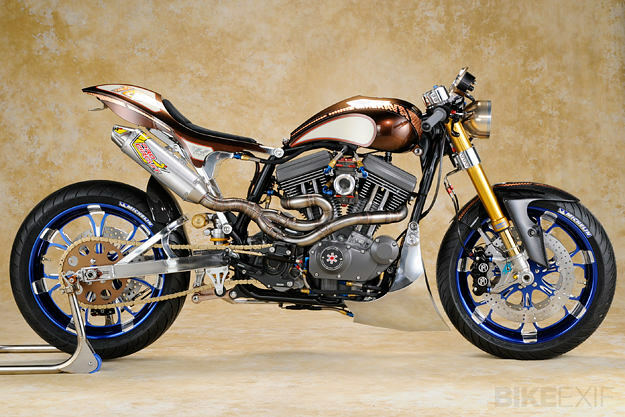 This is a showbike that also knows how to go—thankfully a combination we’re seeing more of these days. I ask Hoshikawa if there’s anything he would do differently on Avanzare. Except for a rethink of the tiny, lightweight battery that has given problems, he can’t come up with a thing. Me neither.